No matter what your level of design is – from beginner to master coder – there are times when you need ready-to-use web development assets. Codester is a one-stop-shop for everything from PHP scripts to app templates to themes to plugins. Codester users get access to free assets each week, as well as low-cost individual assets for a number of different types of projects. Here’s a look at Codester and why it might become your new favorite design tool. 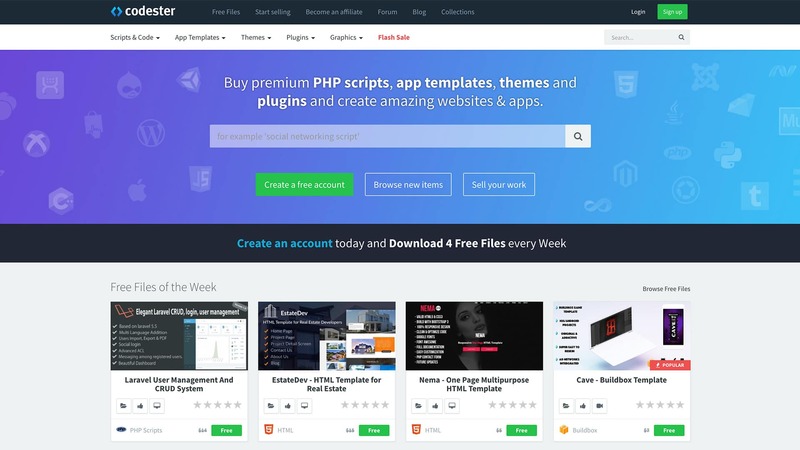 Codester is a web design asset marketplace. It includes graphic elements, code snippets and tools to help you move projects along faster or even solve gaps in your skillsets. Everything you’ll find on Codester is ready to use and once you download an asset, you can apply it however you like for any type of project. It’s free to create a Codester account – and you’ll get the opportunity to download four assets each week. After that, you can purchase items as you need them. Codester accepts a variety of payment options and downloads are immediate. What Can You Find on Codester? The Codester database includes more than 5,000 digital assets that you can search by type to find something that will help your projects move along faster. You can also search by new or sale items. Every item comes with a full description and assets are rated so you can browse popular items or those with the highest ratings. It’s a common question among designers – why should you use items from a marketplace? The answer is simple. Premade elements – from code to themes to plugins – can help you get projects moving along quicker. It can save you a lot of time in workflows. There’s no need to spend tons of time coding an element when you don’t have to. That’s what makes a marketplace such as Codester so great. It’s pretty easy to see how you will save time when you only have to search one marketplace for what you need and download everything at once. The benefit to using a marketplace such as Codester is that it makes it quicker and easier for you to finish projects. Codester isn’t just for designers looking for digital assets. You can sell your designs, too. One of the main reasons to consider selling digital assets on Codester is a great commission rate for sellers. You will earn 70 percent without exclusivity requirements, which is currently the highest commission rate available for digital marketplaces. Getting started is easy (and then you can sit back while passive income comes in). Once items are approved, they automatically appear in the Codester database. You’ll earn a 70 percent commission for every sale and those earnings will be deposited to you via PayPal or wire transfer monthly. If you are a creator that makes anything you’ve seen in the categories above or by browsing Codester, this could be a viable business opportunity for you. It’s easy to set up and you don’t have to manage your own storefront. It’s all part of the marketplace on Codester. Browse the library to see everything the marketplace has to offer. Or if you want to make a little extra money, create a seller account. With great commission rates and a strong community of users, Codester could be the perfect way to help generate a stead stream of passive income from your design skills. Start selling today.